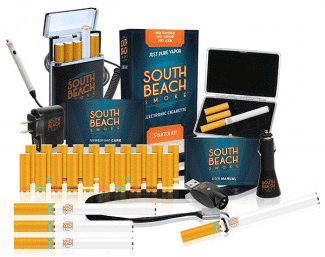 South Beach is already a brand that is widely known in the e-cigarette industry that started their business in 2010. They are based in Florida and in the 5 years of being in the business they have gained many followers that continue to buy their electronic cigarettes. They promise to give you an alternative to traditional smoking through their e-cigarettes and they make sure to provide the kind of electronic cigarettes that actually feels like the real thing. EverSmoke is another brand that comes from the same company that manufactures South Beach Smoke so both have some similarities in their performance but one of the big differences between the two brands is in terms of how they look. 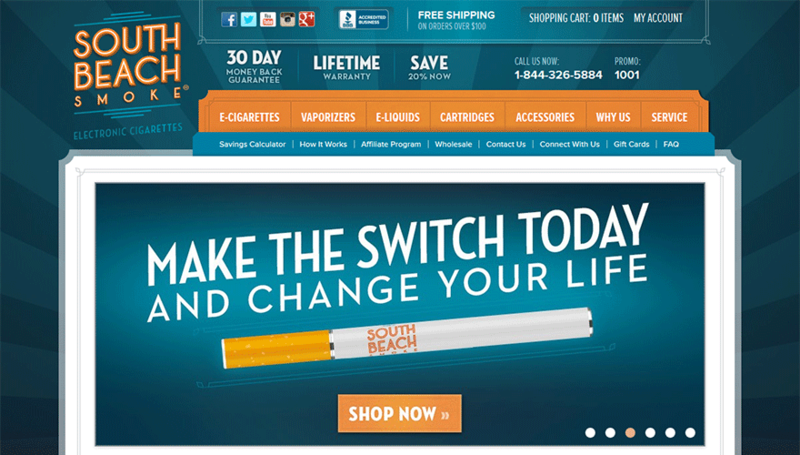 South Beach Smoke e-cigarettes are barer in appearance similar to what you’d expect in real tobaccos while the EverSmoke brand is more appealing. Great amount of vapor is produced through its VaporFlo technology. The battery lasts for more puffs as compared to other similarly priced e-cigarettes in the market today. Offers a 30-day money back guarantee and a lifetime warranty. The live chat support is not offered by their site. The recharge rate is a bit slow compared to other e-cigarette batteries. Each kit comes with an electronic cigarette that combines the atomizer and cartridge in one solid piece that is designed to look like the filter of a standard cigarette. This allows you a better and cleaner draw as you puff on your e-cig. They have 5 kits to offer and disposable e-cigarette packs so you have the versatility to choose what kit would suit your needs best. 10 large cartridges of your choice of strength and flavors. 10 large cartridges with 1 choice of flavor and nicotine strength. 1 automatic deluxe standard battery. 1 automatic deluxe high-capacity battery. 1 manual deluxe high-capacity battery. They have improved their battery with their new SuperMax Battery that now runs at a voltage of 4.2 volts. The tip of the battery makes an orange glow when you puff in the smoke to give you that realistic smoking experience. You can choose from 2 of the colors available, black and white, and two switch types the automatic and the manual type. The batteries come in 2 sizes, the standard one and the high capacity battery. The standard battery is shorter at just 2.5 inches and can last up to 400 puffs. The high capacity battery is longer and measures at 3.25 inches and can last up to 600 puffs. 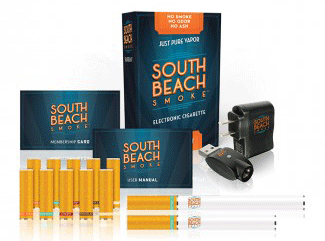 South Beach Smoke recently introduced new flavors into their lineup increasing the total flavors from 10 to 16. The current flavors of South Beach Smoke include Classic Tobacco, Tobacco Blue, Golden Tobacco, Menthol, Double Apple Hookah, Grape Hookah, Lemon-Lime, Orange Mint, Tobacco Mint, Watermelon, Chocolate, Vanilla, Cherry, Peppermint, Pina Colada and Peach. The classic flavor would be for you if you smoke Malboro, Pal-Mal, Winston, Lucky Strike, or Doral. The Tobacco Blue is for you if you smoke Parliament, Viceroy, Kent, Merit or L&M. The golden tobacco resembles Camel, Marlboro, Kent, American Spirit, Merit and other European varieties. 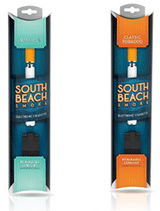 The flavor cartridges of South Beach Vapor is made with their patented VaporFlo technology that gives you a more flavorful and smooth experience giving you the maximum vapor per puff. Strengths: You can choose from are the No Nicotine (0 mg), Ultra-Light (6 mg), Light (12 mg), Full flavored (16 mg) and the Bold strength (24 mg). 5 Packs – $14.99 or $1.99/pack. 15 Packs – $39.99 or $1.77/pack. 30 Packs – $69.99 or $1.55/pack. 45 Packs – $99.99 or $1.48/pack. 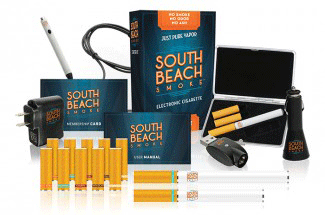 South Beach Smoke offers two combo packages to choose from. One pack is for their original flavors and the other pack is to help you try their newest flavors. 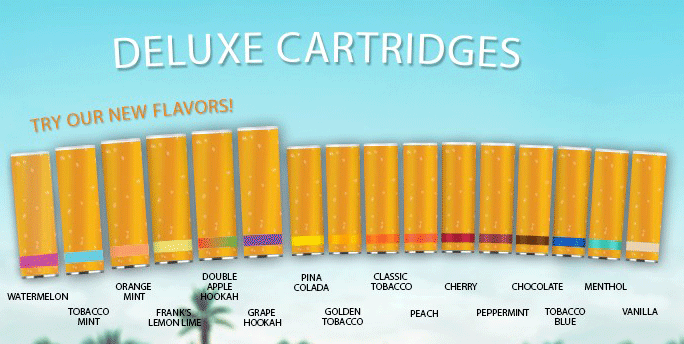 The Deluxe Variety 10-Flavor Pack as shown o nthe left of the image above includes Tobacco Classic, Tobacco Blue, Golden Tobacco, Menthol, Cherry, Chocolate, Vanilla, Peach, Pina Colada and Peppermint. You can order this in a 10-pack (1 of each) $26.60, a 20 pack (2 of each) $46.60 or a 30 pack (3 of each) $66.60. The Deluxe New Flavor Bundle as shown on the right of the image above includes their 6 newest flavors. They only offer one bundle option, a 30-pack that includes the smaller 5-pack of each new flavor that includes Double Apple Hookah, Grape Hookah, Frank’s Lemon Lime, Orange Mint, Tobacco Mint and Watermelon. Price: $66.60. Besides the manual that comes with each starter pack, they also offer an expanded list of FAQs to read and learn from. You’ll also have access to videos that include testimonials, promotional videos and 5 instructional videos that show you how to use their products. Lastly, at the bottom of their page, you’ll find a customer service link that offers a direct email address and a toll-free telephone support that is available from Mon-Fri, 8AM – 10PM EST.